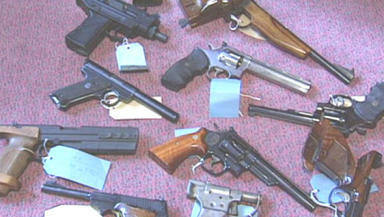 James Dawson wins court battle against Chief Constable over confiscated guns. A gun collector who had 100 weapons confiscated by police over claims he posed a danger to his wife's life has won a battle to get them back. James Dawson has won a civil fight against the Chief Constable after agreeing to strengthen security at his home for storing the large haul of guns. Mr Dawson took the police to court after the guns were taken away when Mr Dawson's wife claimed that she feared she could be shot by her husband. Perth Sheriff Court was told that a specialist security assessment had been carried out and Mr Dawson's storage of the guns was now considered to be adequate. Solicitor Caroline Mackintosh told the court that Police Scotland would now carry out a final check of the property before granting a firearms certificate to Mr Dawson. Mr Dawson had his huge haul of guns removed last year after his scared wife Christine wrote to then Chief Constable Phil Gormley. Police Scotland raided Mr Dawson's home and confiscated shotguns and rifles and removed his licence to keep weapons. The force informed Mr Dawson, 66, that they believed he posed a potential danger to the public after his wife of 43 years claimed she felt her life was in danger. Mr Dawson - who runs a shooting syndicate - launched a legal action at the court against the country's then top police officer. His action states that he should have his gun certificates reinstated because the actions of the Chief Constable were "unreasonable and unjustified." Court papers state: "On January 20, 2017 Inspector Ewan Henderson wrote to the pursuer. "The letter referred to a number of incidents relating to him being the perpetrator of physical and emotional domestic abuse towards his wife Christine Dawson over a prolonged period of time. "Reference is made to ongoing animosity within the relationship, which appears to be irreconcilable. "Reference is made to him being verbally abusive towards his wife for most of their married life." The police letter told Mr Dawson: "She fears that someday you might go into a fit of temper and use one of your weapons to shoot her." Mrs Dawson described her husband as "aggressive, violent and unpredictable when placed under emotional strain . At the time, the couple still shared a home in Perth. The court has heard that Mrs Dawson "does not like his main hobby, which is shooting" because "he is generally an untidy person who creates a mess in the house with his equipment and dogs." Mr Dawson, a retired local authority environmental health officer, told the court he needed his gun licence back because he leases an 1100-acre estate where he shoots hares, rabbits and deer to protect the woodland. He said he was shoot manager for a 32-strong syndicate. He denied being of "unsound mind or intemperate habits" and said he had never caused his wife any emotional or physical distress. "He accepts the marriage is strained and is likely to lead to divorce," his lawyer said. "Although the relationship is strained the marriage has had difficulties for many years. "Both are retired and in the house all day." Mr Dawson told the court he had been a licensed gun owner since the 1960s and had kept his weapons safely and securely stored for half a century.